It’s April’s fools and all companies are giving some Easter eggs away. Our god Google can not be an exception and, from the many pranks developed by the company, this has been my favorite. I don’t consider myself a true gamer (I prefer to go out than stay in front of a computer or a console) but I really enjoyed my 8-bit life with the Nintendo. I even had Atari, Family and Super (among other consoles), but this kind of practical joke really surprised me. For the lovers of Machine Learning, like me, you can easily notice how they developed such 8-bit Nintendo-like platform so quick and fun. Yes, you know how. But stop chatting and go to Google Maps and you’ll see the normal interface, except for a small area in the top right corner of the map. 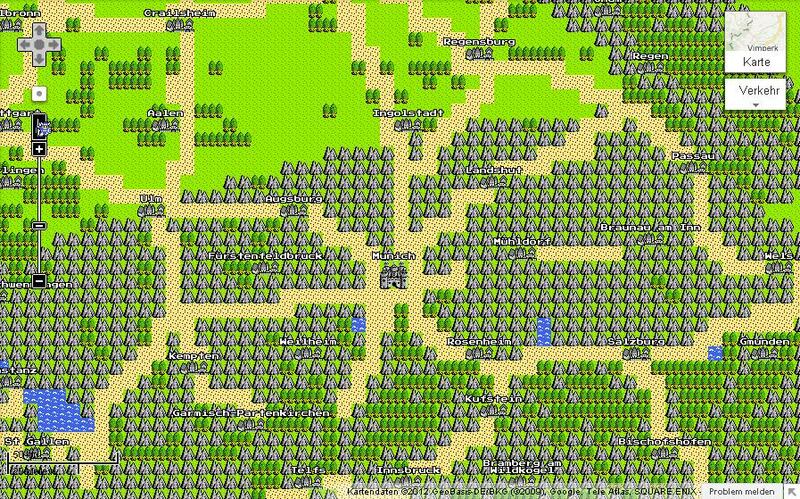 Click on “Quest” (“Mission” in the German version) and your map will turn 8-bit. Done, you are ready to play with Goggle Maps as in the Nintendo. If you don’t believe me try it yourself and I’ll put here the video and a picture of my town and surroundings in Google Maps Nintendo. Be nostalgic, Google gives you the tools. This entry was posted in Entretenimiento, Humor, Tecnología and tagged 8 bit nintendo, 8-bit, April's fool, Easter egg, gaming, Google, google maps, Nintendo, practical joke, prank, technology by Mayitzin. Bookmark the permalink.